We all love cute and if it is delicious looking and no-calorie then put it in the shopping basket! 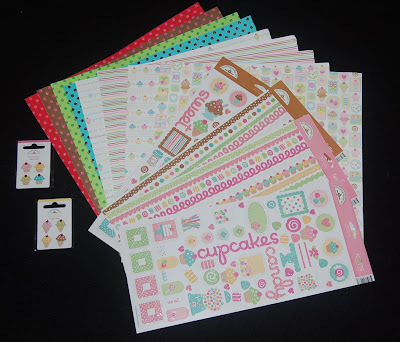 Doodlebug Designs' (the company that has the most edible glitter and glitter paper) new paper line has adorable cupcake, ice cream, and other sweet treats all over their papers, stickers, and brads. Their striped and glitter dotted paper in this line also coordinates well with products from other companies. Plus new from Doodlebug Designs are summery ocean designs and a forest animal line, which work well on projects for boys as well as girls. 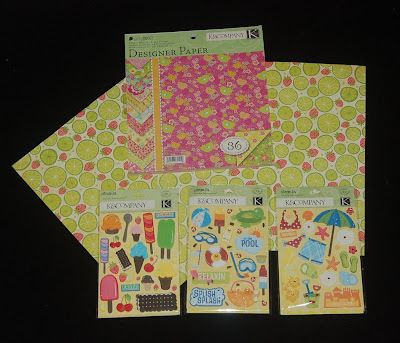 K and Co. is very popular company producing papers and embellishments. Their new flip embellishment packs in a variety of themes are marvelous and very reasonably priced at Ben Franklin Crafts. For the summer their specialty paper booklets in hot colors and their dimensional beach, travel, and pool stickers are ideal for crafters putting together vacation album pages. Spending a lazy summer day or cool summer night with family or girl friend group making album pages, gifts and greeting cards is a great way to share not only supplies and tools; it is a way to share stories and FUN! 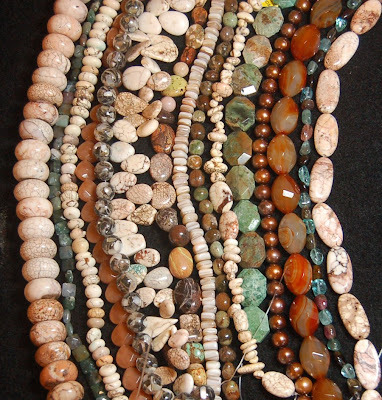 In the new shipment of beads to Ben Franklin Crafts there were large flat oval blue opal beads. 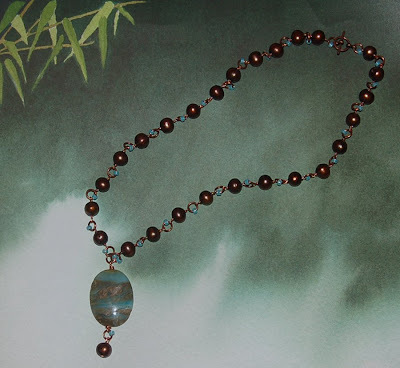 The beads have a lovely ocean color with brown matrix and are a good match with copper findings and bronze colored pearls (also in the bead lot). The necklace takes a little time to wire wrap, but is easy enough even for a novice beader. Because of the colors the piece has a southwestern feel and the oxidized copper gives it an aged look. The instructions for the necklace will be on the craft club website (http://www.bfcraftclub.com/). You may want to create a similar piece with other colored beads, maybe the mosaic mother-of-pearl beads. Experiment with colors and textures to give you the result you desire. Be sure to check out the new beads at Ben Franklin Crafts......lots of gorgeous bargains! 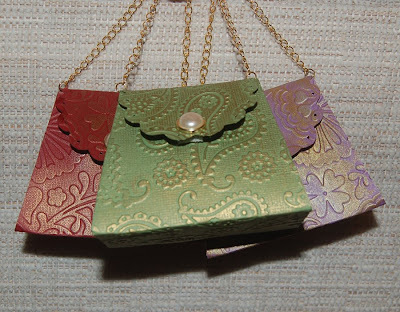 I made these mini purses awhile ago using the Sizzix purse die cutter. After cutting out the purse shapes and before folding I ran them through Cuttlebug embossing folders. I had to run them through twice to cover the entire die cut purse. Because I used thick cardstock the design was embossed deeply into the die cut making it feel and look like embossed leather. To highlight the design I rubbed metallic creme paint (the type used for stencilling) lightly over the unconstructed purse. Next I folded and taped the purse together and added small pieces of velcro for the closure. Finally I pierced holes at the top sides of the purse for jump rings and attached a chain handle. The pearl sticker was something I bought from a wedding supply shop but a pearl button with the shank removed would work just as well. If you make jewelry for gifts this is the ideal gift bag. You would definitely increase sales if you sold these purses with your jewelry products at craft fairs. Recently a huge shipment of beads arrived at Ben Franklin Crafts (should be in the Bead Shoppes by now). Included in this lot are some bargain priced lampwork strands. For some reason the colors of the beads reminded me of Hello Kitty. Also new to the store are Base Elements empty metal frames. The frames come in lots of sizes and shapes. They are designed to be filled with sealed photos, embellishments, or papers and then covered with Diamond Glaze (Judi Kins). I think the frames could also be filled with polymer clay and baked. Anyway, I thought that a Hello Kitty pebble sticker would work well. It did! 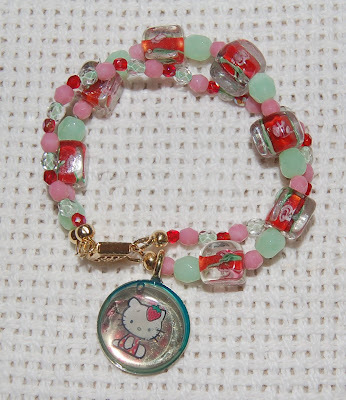 I love the charm and it was easy to incorporate it into a bracelet with matching glass beads. (The bracelet instructions are on the craft club website, http://www.bfcraftclub.com/. ) 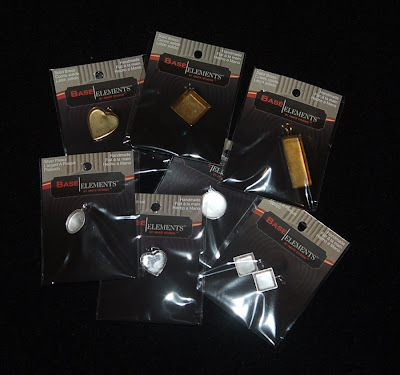 The charms could be used for purse pulls, key chains, necklaces, etc. As long as you seal the item (waterproof) you want to use in the charm, almost anything that fits should work. I sealed a stamp in packing tape before covering with the glaze. Next I think I will try to make some monogram charms using some epoxy letter stickers and glitter. Think of the possibilities! No, I didn't buy cookies or cupcakes, but I did find some new Wilton products that I simply HAD to have. (Recently, I read a magazine article that said you need to make purchases based on need not want. Believe me, these new baking tools are definitely NEED items.) 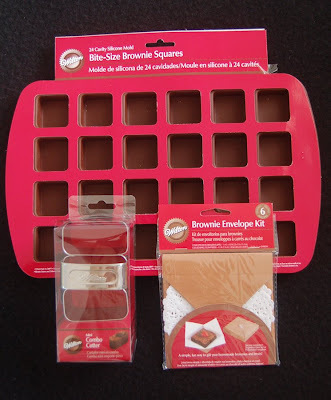 If you are a baker then you must see the new brownie baking items available at Ben Franklin Crafts. Included in the new line are some cleverly shaped brownie cutters, which I plan to use for shortbread too. Papercrafters will love the brownie packaging sets of boxes, stickers, and paper liners because they are perfect for embellishing with die cuts, sparkly stickers, tags, etc. I purchased the mini bite-size brownie silicon mold to make brownie petit fours, but I think it would also make a great guest soap or bath fizzy mold. Even if you just bake brownies from a box mix, I think you will find this new Wilton brownie line of products a super way to make homemade treats and gifts. Who doesn't LOVE brownies? My son just received his ten year piano pin for guild auditions of ten memorized pieces each year so I thought his teacher deserved a thank you gift for helping him accomplish this goal. The teacher is a classy lady who often dresses up for performances. (Pearls are so elegant but they can even be worn with jeans.) 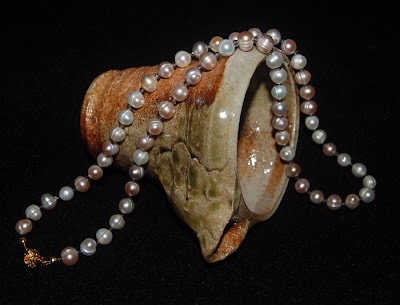 I started with a strand of soft colored pearls in shades of cream, pink and gray. Rather than using silk thread and knotting between the pearls I chose to string the 60 pearls on beading wire and put 3 mm silver gray bi-cone crystals between each pearl. The crystals add a bit of sparkle to the necklace and make it more modern. I think the tiny gold plated rose clasp (Kiwa) is the perfect dainty closure. All of the parts for this necklace are from Ben Franklin Crafts Bead Shoppe. I think you will be surprised at how easy it is to create this necklace and will find that it not only makes a terrific teacher's gift, but it would please a graduate, too. If you are (like me) interested in pottery, the vessel in this photo is a piece I purchased in Japan at an outdoor fair. I recently learned (from the Martha Stewart show) that this piece of pottery is a sauce container used to pour noodle sauce over soba. When I bought the container I just loved the wood ash glaze and thought that I would use it for a vase. The next time I make soba noodles I will use this ceramic piece to pour sauce over the noodles instead of dipping them in a small sauce dish. I'm happy to learn new things everyday! I was so excited to use the new Hello Kitty Sizzix die cutter (the one with her lying on a beach mat) that I cut and pieced together multiple images. I didn't like the paper that I chose for the bikini on one of the images so I just colored over it with sparkle pens. Since it was an image I wasn't going to use for my projects (because it didn't match) and I needed a birthday card for my niece, it became the focal point of the card. A little punched out (MS punch) cupcake was added to the card to convey the birthday wishes. 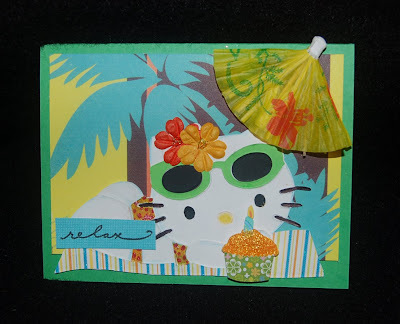 I think the background paper with the palm trees (NRN paper) helped to place Hello Kitty in a setting and the paper umbrella (from the BFC graduation section) not only added dimension but sort of symbolizes a summer of party fun. Inside the card I placed a rub-on with the words, 'It's Your Day' so that the birthday girl would relax and enjoy her birthday. In this rush-rush society sometimes we need to be reminded to slow down and inhale the goodness on our birthday and everyday of the year. Breathe and blog, breathe and blog, breathe and blog............! I remembered that we need to congratulate two more graduates and they are both guys so my oh-so-girly cards cannot be used. Because money is probably the most welcome graduation gift, I wanted to figure out a clever way to incorporate it on the card. Rather than fold the bill origami style, I decided to roll it into a diploma, tie it with a ribbon and adhere it to the card with Merikan double stick tape (place it on the ribbon not the money). The scrapbook paper used is from Kangaroo Post, but any graduation print will do or you can rubber stamp something in the background. I cut the black cap in a slightly off angled square to make it look like it was being tossed. The tassle was made from embroidery (maybe it was crewel) floss. 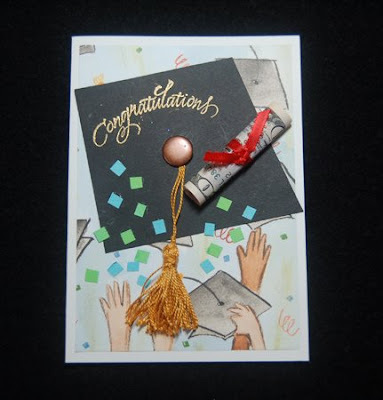 To add a little more interest I glued on hand-cut confetti but you might want to stamp and emboss ' Class of 2009'. Anyway I hope this card gives you some ideas of what to make for your graduates. Thanks for visiting this blog. Please come back and visit again.